1. Enhances the immune system. 2. Lowers and/or stabilizes blood pressure. 3. Slows the aging process. 4. Improves learning ability and memory. 7. Brings your body, mind, and spirit into harmony. You do have to find time to meditate. You should choose a time of day when you are least distracted and are able to be calm. You might want to start with a 5-minute meditation and try different lengths of time as you explore the process. Also, decide on a comfortable posture. While most teachers suggest sitting positions, I have always found my best meditations occur when I lie down, and surprisingly, I do not fall asleep. Try different postures to find what works best for you. If you are seated, you might try staring at an icon (religious figure, candle, etc. ), and in doing so, allowing yourself to “empty” your mind. If you are lying down, you can stare at the ceiling. Be patient with yourself, so if many thoughts come racing through your head, simply allow them to clear. You may wish to focus on one word (such as “love”) to center yourself. 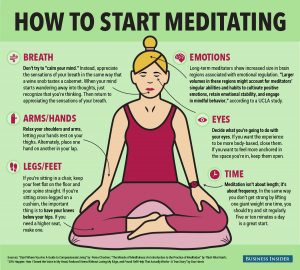 You can also practice the simple technique that I call “stopping.” Simply sit for five minutes each day and allow your body to rest. Take a few deep breaths and be still. In that moment, be with whatever comes up, and let your mind slow down until your body, mind, and spirit feel in greater harmony.